There are times each day that I feel like a referee- constantly breaking up little squabbles between the boys. Other times though, they surprise and delight me with their impeccable manners and politeness. Anneke seems to bring out that side of them more than anyone else does. She inspires her older brothers to take turns, share, and be gentle- to think of someone else's needs besides their own. When she sneezes, Josiah immediately says, "bess oo, Onka" (bless you, Anneke). When she cries both boys shush and pat her, croon loving words to her, or sing her a song. 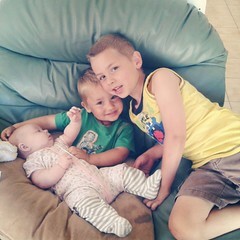 Both Zak and Josiah adore their baby sister, and love to give her hugs kisses. It's incredibly sweet to watch, but we do have to warn them not to overwhelm her or get in her face too much sometimes. Between our warnings and what they've worked out between themselves, they've decided that the best way to approach her in the mornings is to take turns. Every morning when we all wake up, they like to give Anneke attention. This morning, Josiah was the first to come give kisses and hugs. He climbed up onto our bed (not the simplest of tasks for a short-legged two year old), and said, "hewwo seek girl" (hello sweet girl), and gave her a kiss on the tummy while stroking her head. Zak, seeing that we were awake and it was ok to come, came up beside Josiah and asked, "Can I have a turn, please?" Josiah replied, "Yes- may" (Yes you may), and backed off so that Zak could cuddle her for a minute. They switched back and forth like that (Josiah saying, "Onka turn peas?" (Anneke turn please) whenever he wanted a turn with her), for a few minutes. Once Zak tried to cut Josiah's turn short, and when he asked for a turn, Josiah said no. I told Zak to wait a minute and then ask again, and Josiah happily relinquished his place given a little more time. Another time, Zak forgot to say please when he asked for his turn. Zak said, "Can I have a turn?" and Josiah just stared at him from his spot laying his head on Anneke's tummy. Zak corrected himself: "Can I have a turn, please?" and Josiah immediately acquiesced with a happy, "Yes- may", and backed away for Zak to take his turn. There were thank yous and you're welcomes mixed in as well. When I was pregnant with Anneke, before I knew if she was a girl or boy, I prayed that she would be a peace-maker. Some people naturally seem to create a little bubble of peace around them, while others seem constantly surrounded by drama and conflict. Obviously creating peace in our family is, with God's help, primarily my and Raoul's responsibility. I would never place that responsibility on a child's shoulders. However, I did pray often that the newest member of our family would be a naturally peaceful person and that he or she would help balance our family. It's beautiful to watch the little ways that just having her here brings out the best in us. It's not what she does- it's our love for her as a family. Raoul and I are constantly learning as parents, and each of our children teaches us, challenges us, and strengthens us in different ways. Zak is extremely extroverted, where Raoul and I are both introverted. He definitely pushes us out of our comfort zones sometimes. Zak can talk to anyone about anything, and one of his favourite things to talk about (when he's not talking about dragons, snakes, or sea creatures) is Jesus, and how he died on the cross to save us. Talk about challenging! Our pastor overheard Zak talking to someone about Jesus at a baby dedication we were at on Saturday. On Sunday, the children stayed in the service, and our pastor asked Zak to tell everyone what he told the person on Saturday. Zak spoke clearly into the microphone and said, "Jesus died on the cross for us because he loves us...and Jesus died for our sins." Our pastor thanked him and went on to give a short sermon about how we need to be unafraid to share the gospel, and challenged us not to let a week go by without telling someone about Jesus. I have always felt a bit guilty and discouraged when I hear sermons about evangelism. As a child, I wanted to be a missionary. I've gone on missions trips and such in the past, but I am a stay-at-home mom, and a very introverted and somewhat isolated one at that. I spoke with our pastor after church about my feelings on the matter, and was really encouraged. He said that he doesn't really like "cold evangelism" (walking up to a random stranger and asking if they know Jesus) he feels friendship evangelism is much more effective, but said that we shouldn't isolate ourselves in our Christian circles- we need to go out and try to make friends and always be open about our faith. I was challenged because although I do have friends who aren't Christians, I tend to just avoid the topic of religion completely. My pastor again encouraged me by saying that rather than bringing up the topic outright, I can simply be open about how faith impacts what I do. When I talk about the challenges of motherhood, I can also mention that I pray and that God helps me through things. I can pray for my friends, and that God will open their hearts, and I can be ready to explain if they ever come to me and ask about my faith. For that to happen though, I need to be more open and stop censoring what I say for fear it might offend someone. So you see, through Zak, I've been both challenged and encouraged. Challenged to share my faith, and encouraged that even if I haven't been very good at that in other places, God has been using me and Raoul to teach our children about Him, and by His grace, our children are learning and growing in their faith. I pray that Zak will never lose his faith or his passion and ability to share it with others, and that his younger siblings will follow in his footsteps in those areas. Josiah has been much more easy-going than Zak and, in a way, it's the very easiness of him that challenges us. Josiah is an introvert like Raoul and I, and he clearly has an engineering bent, so he's easy for us (especially Raoul) to understand. Zak, with his extreme extroversion, intense emotions, and dramatic flair, is more difficult for us (especially Raoul) to relate to. We are challenged to be just and fair; not to be harder on Zak than we are on Josiah simply because he is older and more intense, and not to be easier on Josiah because he so rarely gives us a problem. If we fail to diligently discipline Josiah because he doesn't act out as often, we are doing all of our children a disservice. Josiah, through being our second child and so very different from his older brother, has taught us that our children are individuals with very different abilities, strengths, weaknesses, and needs. He has taught us that we need to be fair, but that we can't and we shouldn't try to make everything equal because that would mean treating them exactly the same when they aren't. There are so many different ways that our children teach us and challenge us to be better people and parents- these are just a few that have been on my mind recently. What are some of the ways your children challenge you to be better people?